The sprawling Pointe Hilton Tapatio Cliffs Resort provides a relaxing retreat with an endless array of amenities. The resort offers two restaurants and a pool bar, eight swimming pools with rock features and waterfalls, 18-hole championship golf course, lighted tennis courts, fitness center, full spa with a range of treatments, laundry service, and complimentary Wi-Fi internet access. Air-conditioned guest rooms have private bath with hair dryer, separate living space, minibar, coffee-making facilities, TV, and phone. 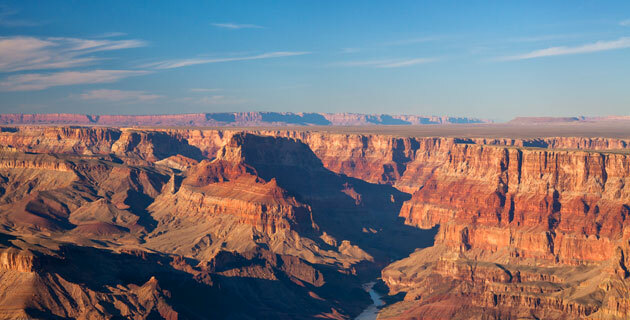 Set just minutes outside the splendor that is Grand Canyon National Park, the Best Western Premier Grand Canyon Squire Inn offers a host of amenities. Along with three dining options (a coffee bar, restaurant, and sports pub), the hotel offers a fitness center, indoor and outdoor pools, game room, outdoor fireplace and sitting area, bowling alley, and complimentary Wi-Fi internet access. Air-conditioned guest rooms have private bath with hair dryer, tea- and coffee-making facilities, in-room safe, TV, and phone. Lake Powell Resort enjoys a striking location on the shores of Lake Powell, just a few hundred feet from the border between Arizona and Utah and offering long views across the lake and striated sedimentary hills of the region. The resort’s amenities include a restaurant, bar, and lounge; outdoor swimming pool; walking paths along the lake; fitness center; gift shop; sauna; fishing and water sports activities (for a fee); laundry service (for a fee); and complimentary Wi-Fi internet access in public areas. Air-conditioned guest rooms are decorated with Native American accents and have private bath with hair dryer, coffee-making facilities, private balcony or patio, TV, and phone. Rustic, spacious, and comfortable, this hotel is nestled among the red rock cliffs of Bryce Canyon National Park. It features spacious common areas, a restaurant, fitness center, pool, complimentary Wi-Fi internet access, and laundry and dry cleaning services. The dining room provides a lodge-like atmosphere complete with wooden beams stretching across the vaulted ceilings, and a brick fireplace in the center of the room. Each of the 164 air-conditioned guest rooms have private bath with hair dryer, coffee maker, microwave, in-room safe, minibar, and TV. Zion Lodge is the only lodging option that sits inside Utah’s Zion National Park. The lodge was originally designed in 1924, and although most of it was destroyed by a fire in 1966, a number of original guest cabins and support buildings remain, and the lodge itself is a member of the National Historic Hotels of America. The warm, inviting lodge sits at the foot of a red-rock butte and offers a restaurant and cafe and complimentary Wi-Fi internet access. Air-conditioned guest rooms have private bath with hair dryer, tea- and coffee-making facilities, TV, and phone. The Westin Las Vegas enjoys an ideal location: just a block from the Las Vegas Strip in the heart of downtown. While many of the country’s finest casinos and restaurants sit just a short walk away from the hotel, the Westin offers a tranquil retreat from the city and features a restaurant and bar, fitness center, heated rooftop swimming pool, spa, gift shop, laundry and dry cleaning service (for a fee), and complimentary Wi-Fi internet access. Air-conditioned guest rooms have private bath with hair dryer, in-room safe, tea- and coffee-making facilities, minibar, TV, and phone. A coffee table tribute to the geological wonderland of “Red Rock Country.” Award-winning photographer and writer John Annerino takes us through the echoing canyons, towering hoodoos and cliff dwellings of the region’s beautiful parks and reserves. One of the great works on the value of the desert, eloquent and laugh-out-loud funny. Although Abbey writes specifically about his experiences as a ranger at Arches National Park outside Moab, Utah, his message is universal. A compact field guide to the wildlife of the high desert of the Colorado Plateau and the nine national parks of the region. Williams includes an overview of the history, geology and ecology of the high desert, along with basic information on identifying common plants and animals. This lavishly illustrated guide includes excellent color maps and thoughtful short essays on history, culture and attractions. With chapters on numerous destinations including Phoenix, Sedona, Navajo and Hopi reservations and ghost towns. A map of the American Southwest at a scale of 1:3,000,000 with roads, parks and topography. A fold-up map of the Grand Canyon, shown at a scale of 1:70,000. A detailed hiker’s topographic map of Zion National Park at a scale of 1:38,000, printed on tear-resistant, waterproof paper. A practical guidebook in the popular series, with up-to-date advice on what to see and what to skip. Includes highlights, suggested itineraries, updated contact info, 65 full-color maps and much more. Neither too big nor too slight, these handy guides include just the right amount of information on neighborhoods, shops, hotels, restaurants and sites for a short visit. Well-organized and with an excellent pullout map. A short visual tour of Sedona, covering the region’s many beautiful attractions and breathtaking landscapes through gorgeous color photos and brief text. A fascinating look at how we “picture” America, this art book traces the history of national park photography, featuring a wide variety of the most magnificent parks (from Acadia to Zion) and the historic work of artists such as Ansel Adams and Lee Friedlander. Focusing on the example of Glen Canyon, Farmer traces the development and exploration of the Four Corners region, and discusses the role of tourism in changing the face of the West. The classic tale of adventure and exploration of the rivers and canyonlands of the Colorado Plateau, originally published in 1875 — and still terrific reading for any traveler to the Grand Canyon. Tom Miller’s digressive, witty and willfully eccentric account of travel and obsession in the American Southwest (originally published as Jack Ruby’s Kitchen Sink) captures the spirit of his beloved homeland. Joseph Wood Krutch celebrates the austere beauty, rugged plants and many animals of American Southwest in this classic account of his first year in Arizona, winner of the 1954 John Burroughs Medal for a Distinguished Book of Natural History — and still enchanting today. With 33 original illustrations by Rudolf Freund. Both an English professor and river guide, Lance Newman selects well from the accounts of early explorers, popular fiction and contemporary literature by writers as diverse as John McPhee, Ann Zwinger, Edward Abbey and Barry Lopez. This unprecedented collection of photographs explores the diverse canyon country of the Colorado Plateau, including: Grand Canyon, Bryce, Zion and Arches. Quotations by authors and explorers accompany the 200 color photographs. The definitive history of water development in the American desert — and a now-classic chronicle of wrong-headed policies and misadventures in controlling the great rivers of the West. An informative guide to the geology of the Colorado Plateau, some of the most ruggedly beautiful land in the Southwest. With mostly black-and-white photographs, maps, diagrams and glossary. A compact guide to the natural history of the Grand Canyon with 71 handsome color plates, maps and illustrations. This handy laminated card features color illustrations of commonly encountered birds, mammals and reptiles of the Grand Canyon. Can be easily slipped in your pocket.